Brunel’s friend Thomas Guppy, a Bristol engineer and business man who had been instrumental in establishing the Great Western Railway, took the practical step of bringing together the necessary partners to form the Great Western Steamship Company with a view to making this happen (Guppy was also a trustee of the Clifton Suspension Bridge and a valued colleague to Brunel). 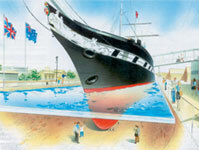 Brunel’s first shipbuilding project for the new company was the ss Great Western. The ship was built by the firm of William Patterson, a leading Bristol shipbuilder, with steam engines provided by Maudslay, Sons and Field in London. She was an oak-hulled paddle steamer and the first steamship to provide a regular trans-Atlantic service, heralding a new era of ocean going transport. 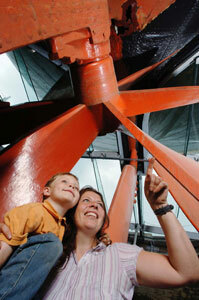 The ship was launched in July 1837 from Wapping (now Prince’s) Wharf and moved to London for fitting out. 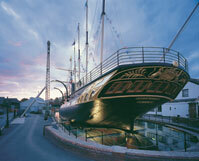 On her return trip to Bristol, fire broke out in the boiler room and Brunel was injured when he fell 18 feet (5.49 metres) to the flooded boiler room floor from a burning ladder. When the Great Western left Bristol on 8 April 1838 for her maiden voyage to New York, 50 of her original 57 paying passengers had cancelled as they considered her too risky a venture. The Great Western Steamship Company’s main competitors in the race to develop a trans-Atlantic steam line was British and American Steam Navigation, a London-based group led by an expatriate American businessman called Junius Smith. 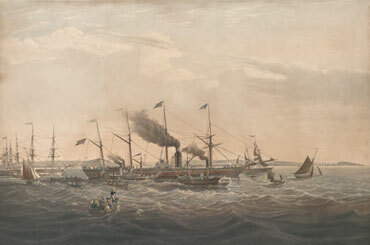 As a publicity stunt, Smith sent the Sirius, a channel steamer, to cross the Atlantic in competition with the Great Western, leaving Cork on April 4 1838. The Great Western left Bristol on April 8 and arrived in New York 15 days later, only 12 hours behind Sirius with 203 tons of coal to spare (a sailing ship would have taken a month). In 1839, Bristol’s Royal Western Hotel was opened to accommodate passengers stopping off en route between the docks and Temple Meads station. However, the Great Western regular service ran from Liverpool instead of Bristol. The hotel façade is now part of Bristol City Council’s planning office, Brunel House. Of perhaps greater significance for world travel was the Great Western’s sister ship, the ss Great Britain launched on 19 July 1843, the largest and most powerful ship to have been built to date and the first propeller driven, steam powered iron ship to cross the Atlantic. Symptomatic of the difficulties Bristol faced in its ambition to be a major port, the Cumberland basin locks the ship needed to pass through in order to leave the city proved to be too narrow. 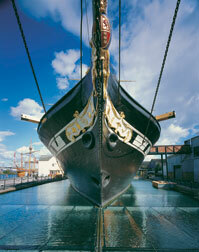 Brunel had to carry out widening work and the ship remained in Bristol until 11 December 1844. I have returned from Dundrum with very mixed feelings of satisfaction and pain, almost amounting to anger, with whom I don’t know. I was delighted to find our fine ship almost as sound as the day she was launched, and ten times stronger in character. I was grieved to see her lying unprotected, deserted, and abandoned by all those who ought to know her value and ought to have protected her. The result, whoever is to blame, is that the finest ship in the world, in excellent condition such that £4,000 or £5,000 would repair all the damage done, has been left lying like a useless saucepan, kicking about on the most exposed shore you can imagine, with no more effort or skill applied to protect the property than the said saucepan would have received on the beach at Brighton. It took nearly a year to refloat her by which time the Great Western Steamship Company was bankrupted. She was bought by Gibbs, Bright and Company. 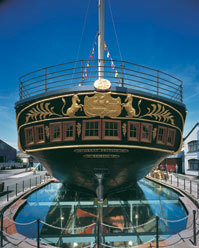 At times of war ss Great Britain served as a troopship, travelling both to the Crimea and to India. 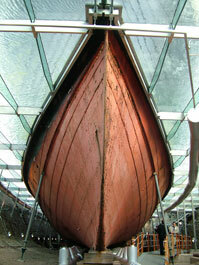 In later years, she was converted to a sailing ship for carrying coal from Wales to San Francisco. Following storm damage off Cape Horn in 1886, she struggled to the Falkland Islands where she was used as a storage hulk for wood and coal. She was beached in Sparrow Cove in 1937. In 1970, the Great Britain was towed home to Bristol where now, partially restored to her former glory, she is a major tourist attraction, dry docked in the Great Western Dockyard that was originally created to build her. She is probably rivalled only by the Clifton Suspension Bridge as a visual image of the city’s splendour, and she makes an important contribution to Bristol’s growing tourism and leisure economy. As a recipient of lottery funding, the ss Great Britain site is undergoing further renewal to enhance the visitor experience. 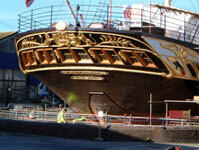 Go to the ss Great Britain website for more details of the history and restoration of the ship.